On my travels around collector’s fairs I have recently been drawn to a range of unusual looking costume jewellery. So distinctive in design it keeps leaping out at me and I cannot walk past without studying its intricate patterns and styles. So intrigued was I that after some investigation and research I found myself being sucked into the vibrant colourful world of renowned French costume jewellery designer – Lea Stein. Lea was born in Paris, France in 1931 and although very little is known of her early years it is believed that a lot of her childhood was spent in a concentration camp during WW2. Lea married Fernand Steinberger in the 1950s but it was not until the 1960s that she embarked in her own business of making creative innovative designs in costume jewellery. Fernand had discovered the process of laminating celluloid; using many paper-thin celluloid acetate sheets he created a multi-layered effect, finishing the process off with a top layer of material such as lace or even straw. Once the layered sheets had been blended they were then baked to harden and various shapes could be hand carved. The master piece could take up to as long as 6 months to perfect and then when totally satisfied it was used as a template to produce the jewellery (or component to use its official term), these components then transformed into the fantastic sculpture designs that today is so recognisable as Lea Stein. From the 60s right through to the 80s Lea produced pins, earrings, necklaces, bangles and even other objects of desire such as picture frames and mirrors. 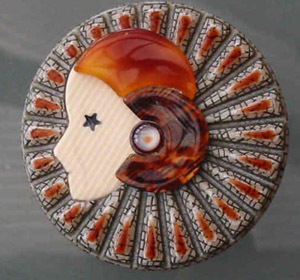 Amongst some of her earlier work are unusual buttons that again vary in design and were bought by French Couture fashion houses, but even rarer are the serigraphy pins, which were typically art deco in style, and were commonly images of ladies or girls framed like miniature paintings. 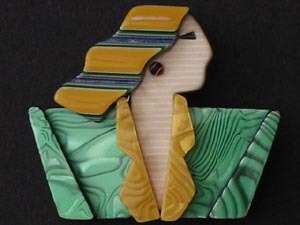 Lea’s patterns and designs vary from the amusing caricature to the classic geometric deco style. 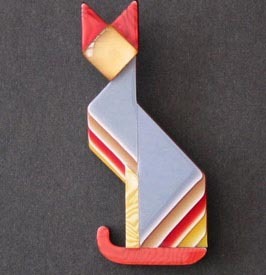 Lea’s great passion for Art Deco shines through in her work with pins such as “Flapper” and one of my favourites the “Deco Cat” which I have seen sell recently for as much as £90.00. The stretch bracelets, bangles and necklaces also have a distinct deco influence with the geometric squares and colours such as green, which were typically used in jewellery during the 1920s and 1930s. One of the more common designs and the one that Lea is most famous for, is the “Fox” pin; these come in all types of colours and patterns and are easily recognisable with their looped tail and outstretched paws. This particular design can be found in layered pattern, pearlized, snakeskin and even glitter. Costing as little as £30 to £35 upwards you could easily just concentrate on collecting the foxes, as there are so many pattern variations. In the 1970’s Lea Stein bought the licence to a French Children’s Television show called “L’ile aux Enfants” – this translated into English means “Isle of Children”. She reproduced the characters onto pins, which were only made during 1975. All the characters were from the programme and include “Casimir”, “Tiffins” and the really loveable “Calimero” who is a little black bird with an eggshell sitting on his head. These are extremely hard to come by and do not come up for sale very often, but if you do find one expect to pay £70 to £100. In the early eighties the company fell into financial trouble and had to cease trading. However, this was not the end of Lea Stein, after a break of 9 years she began making earrings out of the fox head pins and cat faces left over from the factory. She hasn’t stopped there either, now from her home in France Lea is still producing and coming up with new ideas, thus keeping up with the demand from collectors. Prices for Lea Stein vary from as little as £25 upwards, depending on whom and where you buy, but it is actually the more modern pieces that fetch higher prices as less quantities are being made compared to when Lea had a factory and was able to produce on a much higher scale. The more recent designs very rarely appear on the secondary market as collectors snap them up instantly. It is not just the distinctive patterns that make Lea Stein so recognisable, the “V” shaped clasp is the trademark and is signed “Lea Stein Paris” on the back although some earlier 1960s pieces do not have the signature. This clasp creates some confusion about distinguishing the vintage pieces from the more modern but I am reliably informed the only way to tell the age is by the designs themselves. 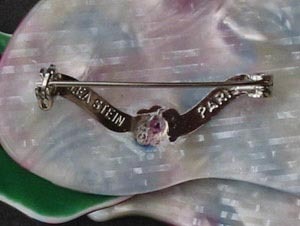 There is discussion that the clasp gives away the age of a piece by whether it has been secured by being melted into the back of the pin or whether it has been riveted. This allegedly is not true, the type of design determines how the clasp is fastened and does not identify the age of the item. Another way to distinguish between earlier and later pieces are the back of the pins themselves, some of the lying down and upright cats have nasty white backing which generally means that they are later pieces. Early vintage designs to look out for are the “Tennis Lady” or “Diver” as she is also known, this particular pin was made between 1968 and 1980 and can cost around £65 – £70. “Rolls Royce”, “French Sailor”, “Saxophone” and even rock legend “Elvis” are also highly desirable to collectors, again made in the same time bracket and costing around the same price on the secondary market. One of the more modern pieces to look out for is the front facing panther. There are only a few on the open market as Fernand and Lea recalled it due to the fact that they were not entirely happy with the finished product. Other modern designs are the bears and Pouf Dog. These too vary in price depending on whether they are bought from retailers or other forms of secondary market such as internet auctions. I am a great believer in getting vast amounts of enjoyment from collecting and what better way than to be able to use the items that you collect as well as admire them. It is the sheer combination of vibrant bold designs and the twist of Art Deco influence that I feel draws collectors to Lea’s work. The other major factor to Lea Stein – and in my opinion the most important – is that when you wear it you are not only wearing a piece of innovative craftsmanship but you are wearing a piece of designer jewellery that will really make you stand out of the crowd.